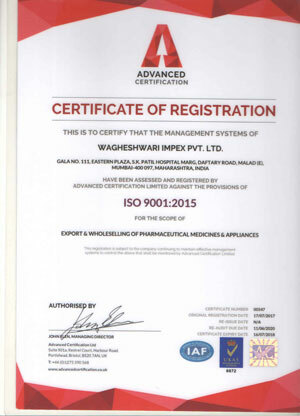 Wagheshwari Impex Private Limited (formerly known as Wagheshwari Enterprises) incepted in 2006, is a distinguished Pharmaceutical Merchant, Wholesaler & Supplying Company based in Mumbai, India. The company has been offering the best quality range with the best services to the world wide marketplace. 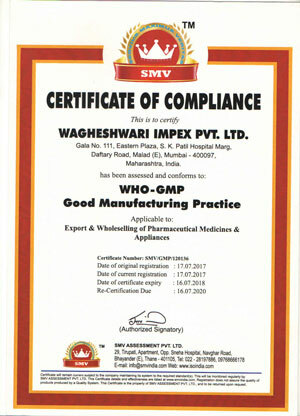 We have become one of the notable contract Manufacturers & Exporters of various Pharmaceutical Products. Our range includes all Indian branded and Generic Medicines like Atorvastatin Tablets, Caberlin Tablets, Diosmin Tablets, Rabeprazole Tablets, Azithromycin Tablets, Indapamide Tablets and Dutastride Capsules. The company has been reaching growth and success under the guidance of talented Proprietor, Mr. Vijay Singh S. Sandhu. We can customize the products as per your requirements with the private labels with FDA approval manufactured by ISO & GMPO certified companies. Moreover, our company offer trusted Medicine Drop Shipping Services & Back Office Services to drop shipping firms located across the globe. We supply medicines both in small as well as bulk quantities worldwide.